The PlayStation 3, while struggling slightly in the gaming department, is an excellent media player. It supports various video and audio formats, as well as having a built in Blu-ray player. It also supports H.264 playback. H.264 is a very advanced video codec used in Blu-ray/HD DVD, and offers better quality and smaller file sizes than DivX/XviD, at the cost of slightly more processing power (and a lot more encoding time). Processing power becomes less of an issue with the powerful PS3, and with H.264, you can encode your own very high quality HD videos. The Xbox 360 also supports H.264 (you can read the Xbox 360 version of this guide here), but the PS3 has one advantage so far and that's support for 5.1 channel AAC sound tracks (the 360 is limited to 2 channel AAC). Important: There are actually three methods to get H.264 playback going on the PS3. One is to use MP4, but this means its limited to AAC audio and that unless you have an AAC decoding receiver, you will not get 5.1 audio. The second method first makes a MKV (instead of MP4) file with AC3 (instead of AAC) 5.1 audio, and then using the mkv2vob utility to convert that to a VOB/MPG file. This strange VOB/MPG file (normally they have MPEG-2 video, not H.264 video) will actually play on the PS3, and the advantage is that it can have AC3 or even DTS 5.1 audio and so you get to enjoy 5.1 audio easily. Unfortunately, this type of video file will not allowing seeking. The third method uses newly available tools to create a M2TS transport stream, which will allow AC3 5.1 audio and seeking (but only forward seeking, apparently). The instructions are common for all 3 methods until a certain point the guide (which will contain more information on the 3 methods), where you will then have to choose one of the methods. Special thanks goes to "Breakthrough" for the M2TS method that he kindly posted on the official PS3 board. Note that the file produced will have a file size limit of 4 GB if using MP4, so be wary of this limit and split your files accordingly. This guide uses MeGUI to provide the H.264 conversion from a DVD source or from other file formats (AVI/DivX/XviD/MOV/HDMOV - many other formats, such as MPG, are also supported). 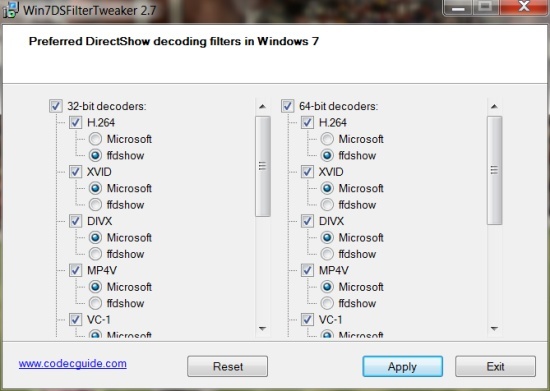 MeGUI is one of the newer tools that's been designed with H.264 encoding in mind. This guide is very similar to the MeGUI H.264 Conversion Guide, except it simplifies a few things and the H.264/MP4 file produced has PS3 compatibility in mind, and with additional AC3 instructions. It also covers how to stream playback the MP4/VOB/MPG file from your computer to your PS3 (the MP4/VOB/MPG file sits on your computer, and when the PS3 is connected to the same network, it will be able to share and play the files located on your computer) using the TVersity software. This guide is aimed at intermediate users that already have some knowledge in regards to video conversion. As such, basic knowledge of things such as framerate and resolution is recommended (and since you are here to experiment with H.264, this assumption is not all that unrealistic). You will also need to know some network basics for PS3 to TVersity connection, such as knowing what your network IP address is, configuring your firewall or port forwarding if your computer is not on the same LAN as your PS3. Press the "Update" button to start the update process - MeGUI will automatically download and launch the install for the required software. Note that when MeGUI asks you to import H.264/XviD/Audio/... profiles, right click and select "Select All" to import all of them (overwrite existing ones if asked). You will most likely get a "1 file had problems" error, this is because the "neroaacenc" software cannot be downloaded automatically from MeGUI due to copyright reasons (it is freeware, but you need to go through Nero's software agreement first before you can download it). You will need to download NeroAACEnc if you want to encode to AAC audio, so if you are looking for AC3 audio, you can skip the following. To download NeroAACEnc, go to this page and download the ZIP archive. There are several files in the ZIP archive, but the files we need are NeroAacEnc.exe. Extract the .exe files to your "megui\tools\neroaacenc" folder (eg. "c:\program files\megui\tools\neroaacenc\win32\neroaacenc.exe"), creating one if it does not exist.